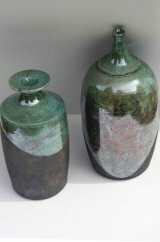 19 Raku vessels, 8-12cm high £50, £68. 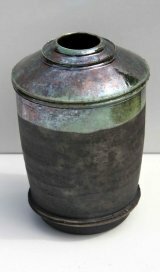 84 Raku lidded bowls, £75, £85. 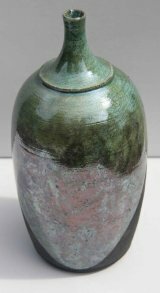 In the 1970s Ian Shearman specialised in sculpture in Cheltenham Art College and then worked in ceramics for Royal Worcester College, Oxford. 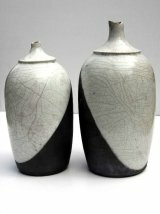 He was subsequently head of Art at Homerton College Cambridge. 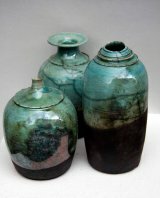 However, his greatest love was painting and he became a full time artist in1997. 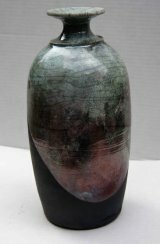 A large part of Ian's work since then has been recording the changing atmosphere of the Roseland coastline, especially the sea in all its moods. 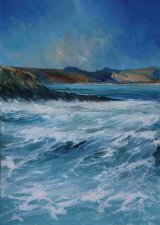 Amazingly all Ian's paintings are completed on the beach, enabling him to paint often rapid changes in conditions. Working this way, using fast drying acrylics, gives a strong sense of 'being there' and an honest response to his surroundings. 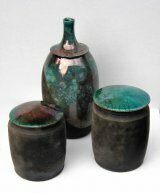 Ian still produces exquisite raku ceramic pieces, from the unlikely set up of a home-made kiln in his garden. Underpinning all of this activity is drawing, reflected in the dry point landscape works of Dartmoor and of his other great love....... fish.